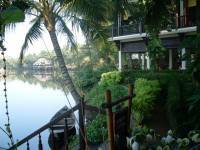 We left Hue & drove to Hoi An over the Ocean Cloud Pass, arriving in the evening, & checked in at the 4* Hoi An Riverside Resort. This is my favourite hotel in Hoi An. This beautifully designed & furnished resort is situated by the Song Do River a few minutes drive from the old town and is very peaceful, enjoying views of the river, rice fields & duck farms on the other side. Every night, the hotel sends hundreds of colourful candle lanterns floating gently down the river creating a very romantic atmosphere. We drank our gin & tonic admiring this unique creation from the hotel. The hotel also has a large & elegant swimming pool set in the tropical garden. The best time is in the morning when we were having breakfast on the hotel terrace restaurant by the river. We enjoyed the peace & tranquillity of the fresh morning air watching the ducks swimming out from the farm along the river shepherded by the boatman - a perfect picture for any photographer. This is the best setting for breakfast that you could dream of. Next we visited the 5* Victoria Beach Resort. a favorite of many of our clients. The Japanese-style villa room was stunningly beautiful with an inner courtyard garden. 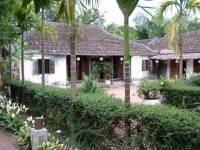 There are also French-style and Vietnamese-style villas. Set right on the beach, and with lovely gardens, the Victoria even has its own elephant ! We also visited the lovely 3* Ancient House hotel. This is an interesting hotel inspired by the ancient Chinese house that is next to the hotel complex. All the hotel rooms are built with this theme in mind in individual houses. The restaurant is lovely with the balcony view over the swimming pool & garden below. 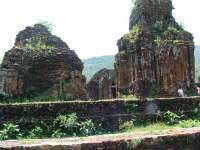 Today we also visited My Son, the ruins of the former Champa Kingdom. It is a pity that these magnificent historical buildings have been heavily damaged by bombing during the war. Several sites have only a few stones left behind, but what is left still makes a lovely visit. Tonight we checked in at another favourite hotel in Hoi An, the 4* Dong An Beach Resort, very popular with our clients for the last two years. The hotel setting is right by the river and has a wonderful swimming pool and tropical gardens, and is close to the beach. The restaurant is lovely with open seating by the courtyard. The rooms are spacious & comfortable. 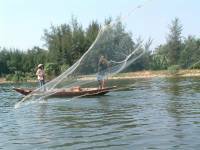 Next morning we took a two hour boat trip on the Hoi An river. This is a very pleasant trip to see the local life. We saw the fish market pier from the river, hotels & houses along the riverbank & fishing by local boats. Later we drove south from Hoi An, to the pier for the speedboat to Tam Hai, a small island about 30 minutes drive from Hoi An, where a delightful small beach resort has been built, comprising just 12 detached deluxe bungalows - 'Le Domiane de Tam Hai'. Deluxe standards start from the boat pier, and after a journey of about 20 minutes, the manager of the resort waits to greet guests at the boat landing. The 12 villas are set along the sandy beach, each with its own garden with direct access to the beach. The interiors of the villas are beautifully designed and fully equipped with stereo (but no television), air conditioning, room safe etc. The comfortable beds are fitted with mosquito nets (although we had no trouble with mosquitos) and the bathroom is actually semi-outdoors, but very private. A lot of thought has gone into the design in order to create an informal, sand-between-the-toes resort but with top-notch standards.The swimming pool is in the best setting that I have seen in Vietnam., surrounded by lovely plants but with a view out to the sandy beach & sea beyond. Even the restaurant and bar are created with pure white sand for the floors. Le Domaine is particularly suitable for honeymooners or others who wish to get away from it all. For activities, there are boat trips to the nearby island for snorkelling with seafood BBQ for lunch on the beach or cycling from the hotel to the island village. My cycling trip on the island was a joy to remember, we borrowed a couple of bikes at about 10:00am. As we were approaching the village centre about half an hour later the village was packed with schoolchildren all coming out of school to go home. They were all shouting hello to us from all directions & smiling for our camera. One little boy jumped on the back of my bike for a lift. Happiness filled the air. I left the island with a lingering thought of coming back for a few days on my next trip. We drove to Danang airport for the flight back to Hanoi and checked in at the 5* Melia hotel, a deluxe hotel in a good position near the city centre. The lobby décor is warm & welcoming, with a strong art déco flavour. 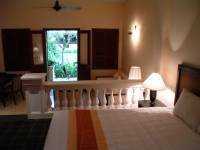 The rooms are large & comfortable with elegant décor. The breakfast buffet is simply delicious. 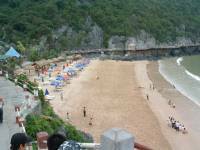 Next morning we drove for 3-4 hours to Ha Long Bay. This journey has to be taken slower than it used to be. Due to the bad road safety record in Vietnam, the police are now rigorously enforcing the speed limits in towns & villages. Our driver was caught by hidden camera and will have to pay a fine of $100 - this represents a whole month's wages for him. There are some new hotels in Ha Long Bay city since we were here last We inspected & visited the 3* Ha Long Bay hotel, the 3* Ha Long I hotel for our Standard group. For our Superior group, we chose the 3-4* Pearl hotel & Saigon Ha Long hotel. 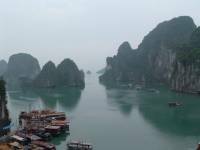 For our Deluxe group, we will add the 4* Dream hotel as well as the Ha Long Plaza that we have been using for all our clients until now. 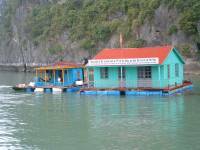 The next morning's boat cruise is the highlight of any trip to Ha Long Bay. The boat cruises for 4-5 hours through the many small islands & rocks emerging from the water forming a uniquely beautiful environment. Holding a bottle of Hanoi beer & sitting up on the deck with views of unlimited water, rocks & floating villages was my best experience on this trip. The seafood lunch with king prawns, crab, crayfish& fish was absolutely outstanding and also the best meal of my whole trip. After the delicious seafood lunch we arrived Cat Ba Island. We checked in at the Sun & Sea guesthouse, a charming Vietnamese guesthouse with traditional Vietnamese decor& furniture.The rooms is very clean & very comfortable with en-suite bathroom & TV. We also visited the the new Holiday View hotel. This just-opened 3* hotel is situated on the waterfront with lovely harbour view of the bay from most rooms. The terrace café & restaurant offer stunning views of the sea & the harbour. The hotel is only about 5 minutes walk away from one of the three beaches, and is the best hotel on the island. Nest day it rained in the morning so we could not walk up to the national park but we visited the famous Quan Y Cave Hospital. A former NVA soldier and great character Mr. 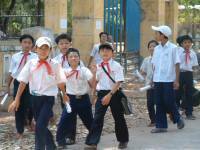 Vu Dinh Khoi now runs guided tours of the cave. Although now over seventy, he is very much the old soldier and his enthusiastic performance in full uniform steals the show. We took the hydrofoil to Haiphong at about 15:00 & from there drove back to Hanoi to catch our departure flight to Bangkok . We arrived at Hanoi airport check-in desk at 19:30. We just made it.building are brighter & bigger and we will use only the new wing for our guests.